Civil war historians and enthusiasts meet on America’s most famous battlefield every year to walk in the footsteps of the soldiers who fought there in July of 1863. The Battle of Gettysburg, the bloodiest fight to ever take place on American soil, is explained to visitors and PCN viewers by Gettysburg National Military Park Rangers (GNMP) and licensed battlefield guides from the National Park Service. New and past Gettysburg Battlewalks are available to stream now on demand on the Gettysburg Collection with a subscription. Exclusively on PCN on cable and the PCN app. 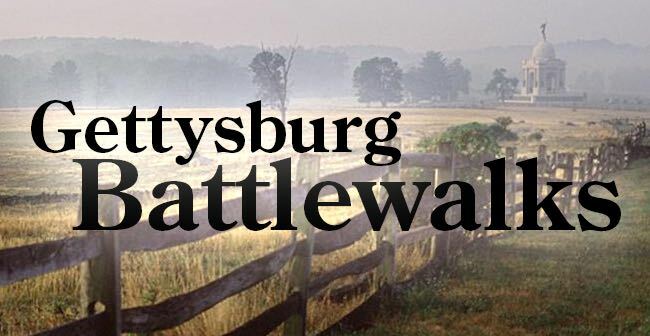 What is a Gettysburg Battlewalk? A visitor taking a stroll today through Gettysburg and the tranquil surrounding countryside can find jarring reminders of violence. Bullet-riddled walls, a gaping hole in the side of a barn from a cannonball, are sobering reminders of a great battle. If you stood on the spot at a certain hour in 1863 that’s occupied by PCN studios today, you would have heard thunderous cannon-fire rolling across the landscape from thirty-five miles away at the Battle of Gettysburg. In that small south-central Pennsylvania town, men were struggling and dying in what history books would call the bloodiest fight to ever take place on American soil. And it didn’t involve a foreign invader. The United States was a country at war with itself. Since 1995, in partnership with the Gettysburg National Military Park, PCN has marked the occasion by televising Gettysburg Battlewalks. On the anniversary of the battle, historians guide park visitors across the actual battlefield in the footsteps of the soldiers who fought there on July 1, 2, and 3 of 1863. ”Being on the same ground that was marched over, fought over, and bled over, helps us to bridge the divide between the past and the present, and hopefully allows us to connect, in a meaningful way, with those who made history at Gettysburg,” says Christopher Gwinn, Chief of Interpretation and Education at Gettysburg National Military Park. “We are thrilled to be able to again work with PCN to share this experience with viewers across Pennsylvania, so that they too can benefit from this experience. "Battlewalks are geared for both the novice park visitor and the advanced Civil War buff. Youngsters can find programs designed for their tastes, too; few kids can resist a chance to learn about crude medical treatment given at battlefield hospitals in 1863. Some Battlewalks offer basic information and take about a half-hour. Others can take about two hours. Choosing one over the other depends on the visitor’s level of interest and physical endurance. Some of the more analytical Battlewalks even entertain what-if scenarios posed by experts who ponder how changing one event might have affected the outcome of the battle. PCN’s cameras record each Battlewalk in a way that makes the viewer feel as if they were along with the group. You’ll hear no voice-over narration, you’ll see no actors or performers, with the exception of a few lucky volunteers who wear woolen uniforms and explain their gear and weapons to make a point. What you will see and hear, are experts and park visitors on a solemn procession into another time, when the future of the United States was in doubt. Armies at the time didn’t know it, but the Battle of Gettysburg proved to be a turning point. Though the Civil War would rage on, the Battle of Gettysburg is considered to be the high-water mark of the Confederacy, because they would never again advance that far to the north. Over one-hundred fifty years later, battlefield visitors and historians alike continue to be fascinated with this unique time in our nation’s history. To help illustrate war’s human toll, park rangers often hold up photographs during Battlewalks of soldiers in uniform. The effect can be startling. Some faces are too young to have shouldered such grave responsibility. They stare out from the pages of history, from another age. They give pause to a person in the 21st century who might wonder how they themselves might have risen to the challenge. Watch Gettysburg Battlewalks on PCN-TV and the PCN app. The Gettysburg Collection is a digital video library filled with hundreds of titles on the Battle of Gettysburg. Tour the battlefield with the Gettysburg National Military Park Rangers, stream a lecture from nationally acclaimed historians, or watch an interview with experts on subjects ranging from key moments and figures in the battle to Gettysburg's impact on the Civil War. The Gettysburg Collection is your complete visual guide to the Battle of Gettysburg, directly from the experts. Subscribe to PCN Select to start watching the Gettysburg Collection today! PCN Select subscribers can use their accounts to watch in HD on the mobile app, Roku, and Amazon Fire.